15 January 2013: In a move to get another project done and to keep Chris employed for part of the winter (when we are not working in the woods or on the farm) we are having him paint the music room, stairway to the second floor, and the little entry hall at the top of the basement stairs. 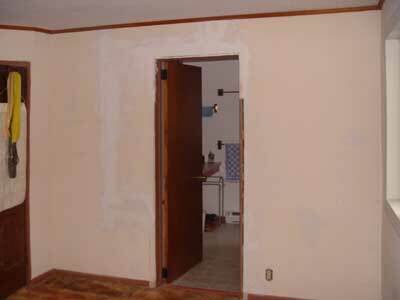 One of the walls in the music room was a real mess, so he has completed a fairly big plaster repair job and has also replaced the crappy casing around the door to the red bathroom. A view of the music room as it was. has been removed from the bathroom door. 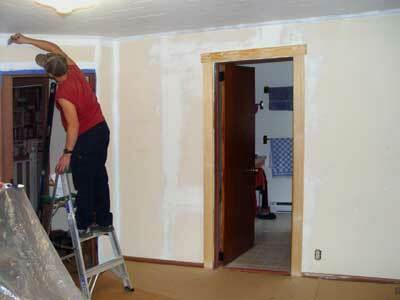 Chris is also working on the closet in our bedroom. It had difficult access, which is now resolved. 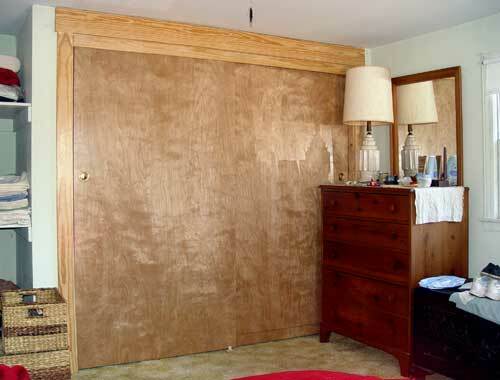 We are awaiting arrival of a pair of sliding doors to complete the job. 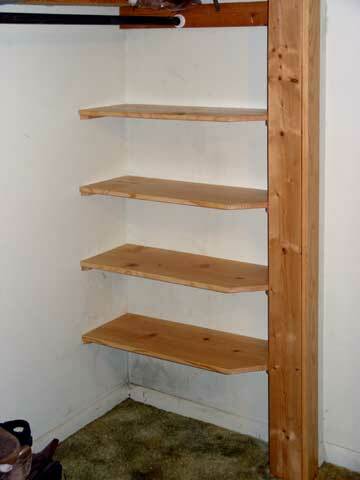 We will also build in a small set of shelves at the right end, once I get to a lumber yard and buy a couple of boards. 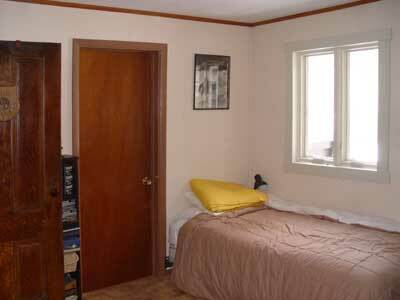 due to the narrow doorway. to either end. 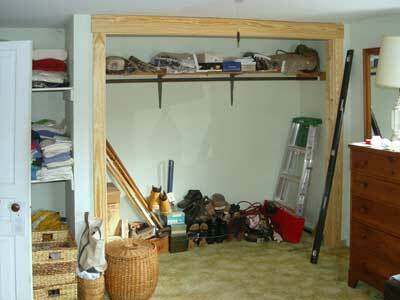 The shelves will go where the stepladder now stands. 20 January 2013: Chris has been at work every day. 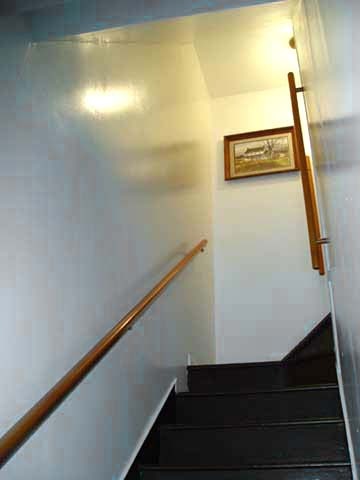 The stairway is finished, as is half of the music room and the little hallway at the top of the basement stairs has been primed. We divided the music room in half diagonally to allow access to half the ceiling and two walls without moving all the stuff out of the room. We have now moved everything to the finished half of the room so we are ready to start on the second half. 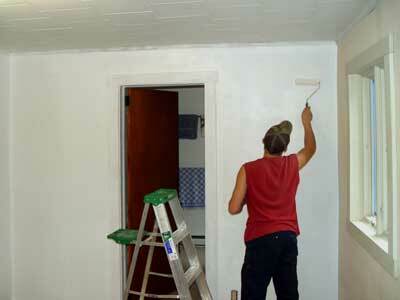 14 January 2013: Primer painting the music room — brush work around the edges, then roller on the larger areas. is from the camera’s flash. I need to reshoot this without the light bulb. 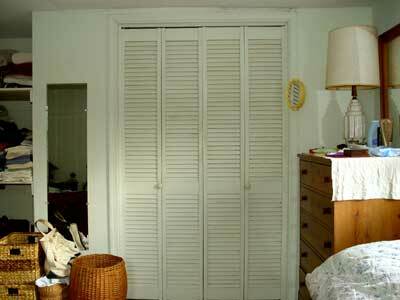 a board and then finished the closet shelves this morning. We are still waiting for the doors to arrive. I made a trip to the Valley on 6 February and picked up our doors at the building supply. Chris and I spent the next couple of days finishing them and installing the track. Not a difficult job but there are always a few little things not anticipated when one is doing something new. Anyway, we got them hung, they work fine and look nice. Now I need to get all the stuff cleaned up and put back inside. Ugh. 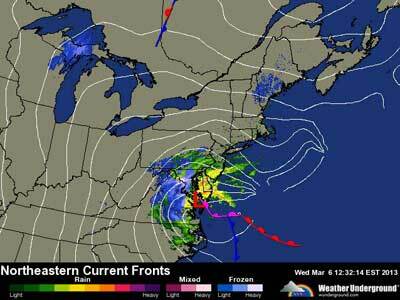 Since the weekend we’ve been hearing on the news about lots of snow and blizzard conditions moving across the country. Warnings grew more dire as it got closer. It was in the 40s and cloudy all day on 5 March but did not even look particularly threatening. Then, just after dark and just after I had come in from feeding, it started to rain a little. The temperature dropped and it soon turned to a light snow. 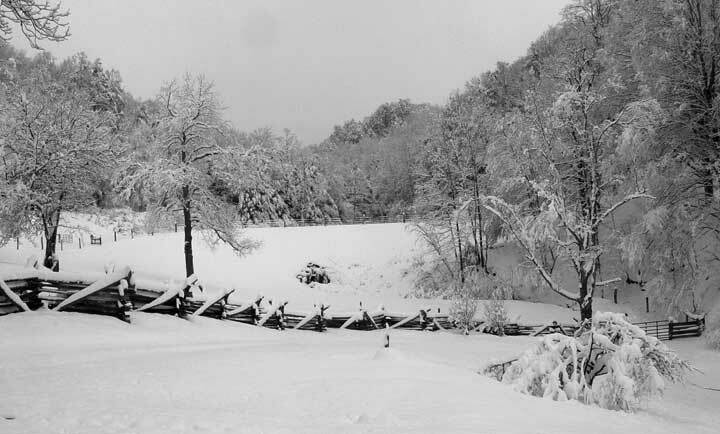 The temperature held just below freezing so the snow was rather heavy as it built up on the ground. By late evening it was really coming down. there was about 4" on the ground. leaving about 11" of wet snow behind. 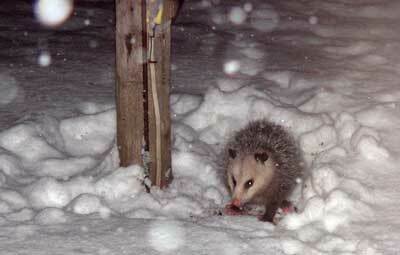 Just after midnight Pogo Possum was seen scavenging for sunflower seeds under the bird feeder. He stayed for at least ten minutes and did not seem to mind my peering out the window at him and flashing lights. An early morning view out the dining room window with the dam in the middle distance and Piney Point beyond. 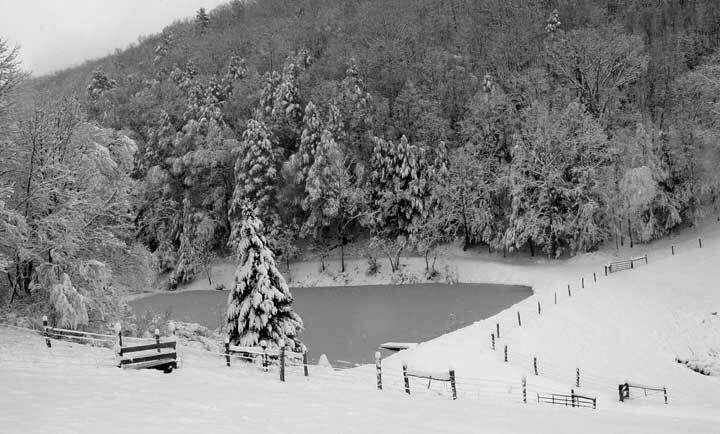 the pond with a balsam fir on the near side and hemlocks beyond. Kathy & Jeff gave them to me at Christmas a couple of years ago. Thanks! 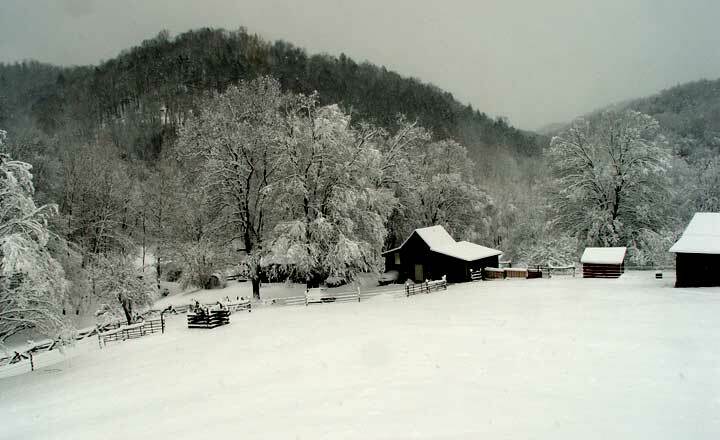 snow-covered trees at left, the garage/toolshed and the barn at far right. 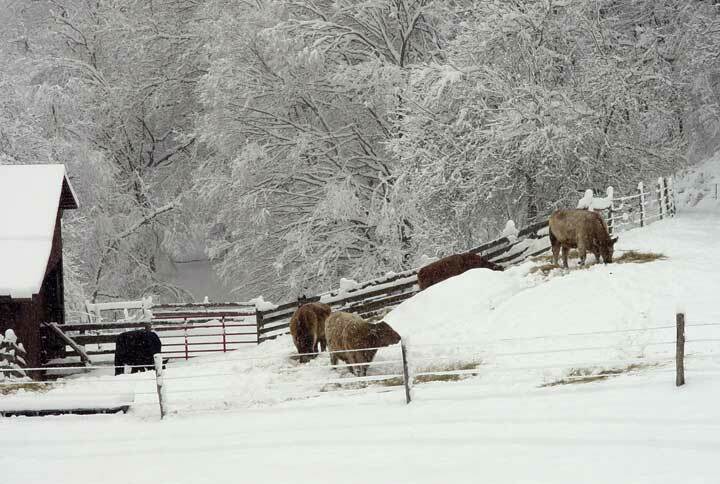 Turning further right, here are our cattle, still working on their breakfast in the barnyard. We have been wanting to install a solar PV system for electrical generation ever since we did the solar hot water system six years ago but we could never quite gather the energy to get started until this spring. Work started indoors in late March, then moved outside as the weather improved. We contracted with Altenergy Inc. to do the work except for the excavation for the foundation and the ditch to carry wires to the house, which I did myself. I wound up doing a bit more than that, as seen in photos 3 and 4, below. What follows is a brief introduction to the project. For a more detailed look go to Solar PV 2013 (Page under construction). 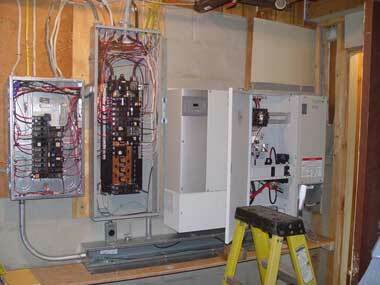 1 April 2013: The tall panel with all the wires is our main service panel. The smaller one to the left holds the circuits that will be powered when the grid is down (most of them). The three boxes to the right are the solar controller and inverter. 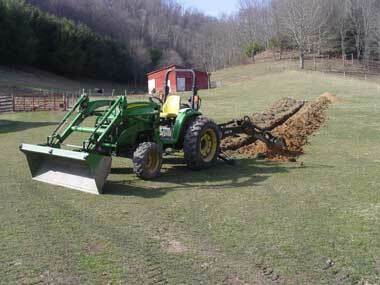 6 April 2013: I have dug the hole for the array support and have started the trench toward the house. 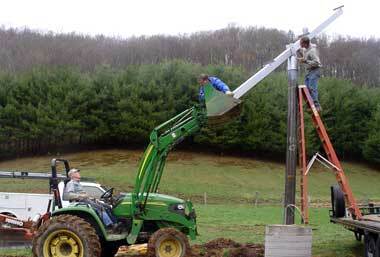 8 April 2013: The ditch is finished and we now erect the mast that will hold the array. 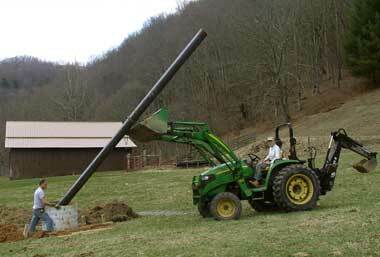 It is an 8-inch diameter steel pipe, 21 feet long. 15 April 2013: With the mast now set in concrete, the main beam that supports the array and controls it’s angle is going up. Joe Sadonis (in the loader bucket) and Matthew Huffman from Altenergy are trying to align it. Both photos by Chris Moore. 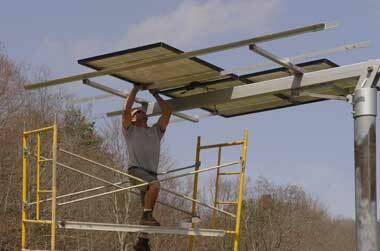 16 April 2013: Matthew is installing the panels. 22 April 2013: The finished array. Our house is at the far left and the barn at far right. Matthew’s truck and trailer are parked at left as he prepared to leave. 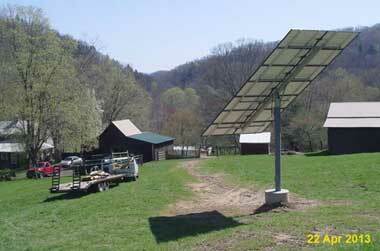 The array generates 3.5 kW when full sunlight hits it straight on. On totally clear days it produces 20 kWh or a bit more and will produce a little bit even on a cloudy day. On clear days we sell power to the utility and on cloudy days and at night we draw power from the utility, which is called net metering. If the grid goes down a transfer switch sends power from the array (or from batteries if the array is not producing) to the house without interruption. No more power outages! Work began on this project with site preparation last fall, then resumed at the end of April when the crew from Virginia Frame Builders arrived. 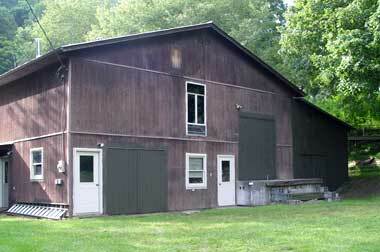 The building is 80 feet long by 28 feet deep with a three-foot roof overhang in front. It is designed to hold all the hay equipment, the dump truck, trailer, backhoe, mower, and a bunch of miscellaneous stuff. What follows is a series of overview pix showing progress of construction. 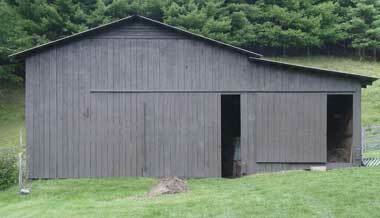 For a more detailed look go to Equipment Shed 2013 (Page under construction). 13 October 2012: This is the job site as seen from the cabin before any work was done. then hauled in about ten truckloads of shale and leveled it out. 2 May 2013: About half of the posts are in place. 3 May 2013: The front and rear beams have now been installed and the roof trusses delivered. 15 May 2013: The trusses have been erected and the purlins are being installed. 22 May 2013: Most of the siding and a few roof panels are now in place. 7 August 2013: The building is complete and much of its contents has been moved in. 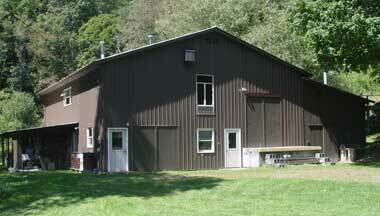 Our warehouse was built in 1988 for the business when we moved here. 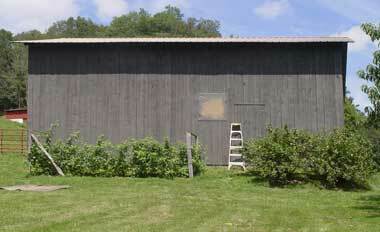 The siding was T-111, which had been stained a couple of times but now badly needed paint. Some sections were deteriorating to the point of replacement. 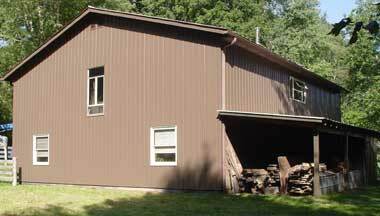 Looking at this we decided to paint the trim and the large doors as well as the attached sheds (which are regular lumber) and to have Virginia Frame back to install the same metal siding that they used on the new equipment shed. 20 July 2013: The front and rear of the warehouse after the white trim was painted but otherwise these are "before" pix. 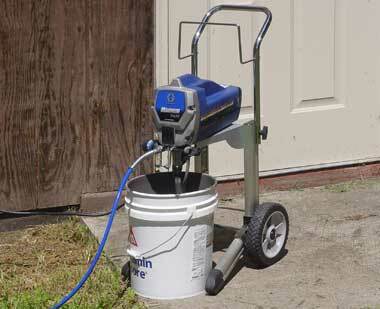 29 July 2013: At left is the new paint sprayer we bought for this job. There is some setup and clean-up work but the actual painting is amazingly fast. Note that it sprays directly from a 5-gallon pail of paint. At right, Chris is spraying primer on the loading-dock door. This took about two minutes for the 72-square-foot door. 14 August 2013: The new siding is all up on the rear and south side. 7 September 2013: All done! The bat house and sign are back up and we have a new bumper strip on the edge of the dock. Our plan was to get as many of our other buildings painted as possible. 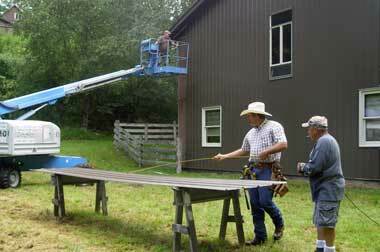 Moving right along to the barn, like the warehouse it had been stained a couple of times but was more than ready for paint. Prepping with a pressure washer took much longer than the painting, about two hours for each coat. When the barn was done we did the woodshed behind the house and got most of the toolshed/garage finished before running out of time. 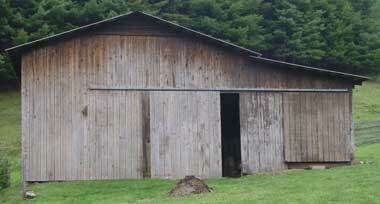 The south side of the toolshed needs a good bit of carpentry work. Next year. 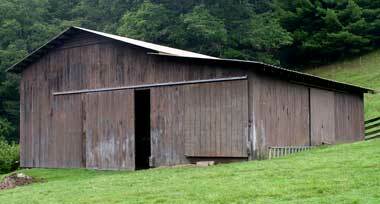 7 August 2013: The barn before work started. 8 August 2013: And after it was pressure washed, which removed much of the old stain. 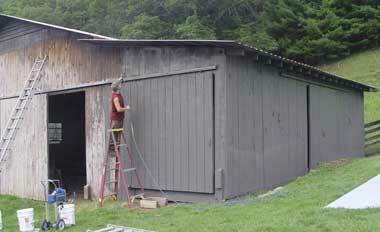 15 August 2013: Chris is primer painting the front of the barn. The north side is done. Right photo, the south side after the primer is finished. 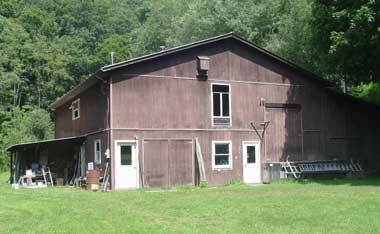 16 August 2013: The final coat has been applied on the barn but the color balance is weird on this shot so it looks like primer. 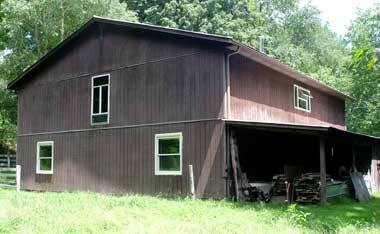 The actual color is more like that shown on the woodshed. 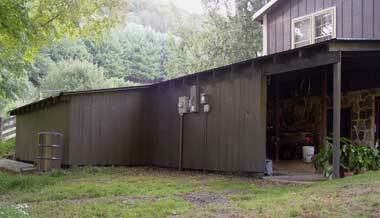 13 August 2013: The woodshed behind the house after painting. Work on the toolshed/garage ran into October and we failed to document it very well but it was just more of the same. Enough about painting already! The large basswood (linden) tree next to our house has been ill for a long time. 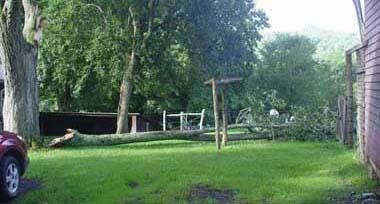 A large branch fell off about 15 or more years ago and damaged the nearby pear tree. 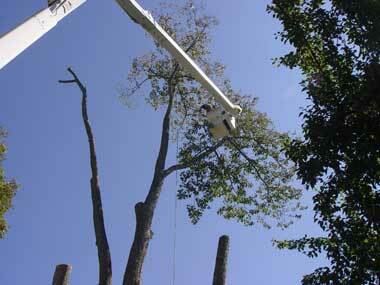 After another limb fell in 2006, we had Eddie Begoon, a professional arborist, evaluate the tree. He felt the wisest course would be removal but we were not ready then so we settled on some major pruning to lighten the crown and remove limbs likely to fall on the house. In 2011 a limb fell, taking out the clothesline and garden fence, then in July of this year an even larger branch fell in almost the same location. That was the last straw so we called Eddie to come back and do the deed. Eddie could not come himself but sent his crew over in September. 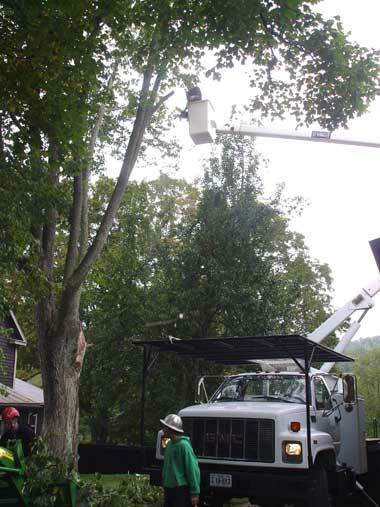 In addition to removing the basswood, they trimmed a large maple tree to improve our TV reception and removed a large cherry limb overhanging the warehouse. Shown below is a brief overview of these projects. 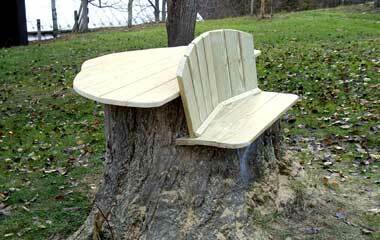 For a more detailed look go to Tree Job 2013 (Page under construction). 23 July 2013: Upper left, the fallen limb that told us it was time to act. 24 September 2013: Right, Kevin Parker makes the first cuts while Joe Inskeep, Chris Moore and I clean up the ground. Lower left, the crown of the tree is getting bare. 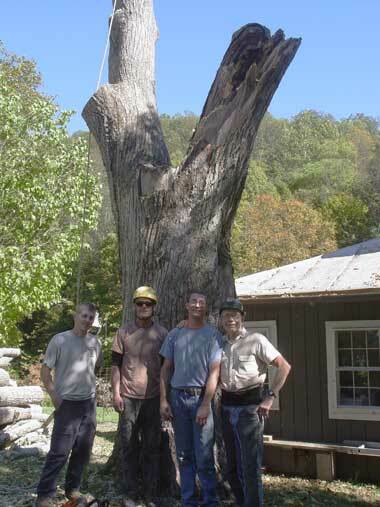 24 September 2013: The work crew: Chris Moore, our farmhand, Kevin Parker and Joe Inskeep of Begoon Tree Service, and me. Photo by Char Sweet. Top right, the base block from the tree, clearly showing its rotten center. 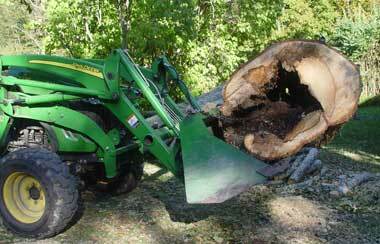 6 November 2013: The stump would have been very difficult to remove so we put it to good use. 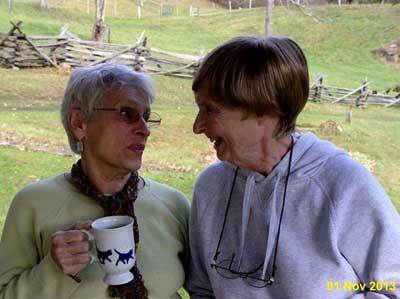 In August Char was diagnosed with small-cell carcinoma, a rare form of bladder cancer. She started out with a doctor in Roanoke, who proved to be abrasive and unsatisfactory. Thru my friend Don Carmichael, a surgeon at Augusta Health, we found Dr. Sam Graham, also at Augusta Health, a urologist expert in this field and a very compassionate person, generous with his time. Thru him we also consulted with Dr. Cary Robertson at Duke University, who re-evaluated the tissue samples to confirm the diagnosis. With their advice Char started chemotherapy at the UVa Hope Cancer Clinic, adjacent to Augusta Health, under Dr. Maya Ghaemmghami, in late September and radiation treatments in November under Dr. David Morgan at Augusta. As if all of this was not enough, chemo was interupted in mid-October when she had another stroke, landing her in the hospital for three days plus a couple of weeks in rehab. Cancer treatments went well after that, with minimal side effects except for the expected hair loss. Char has never been a hat person but now she has quite a collection! She also has a wig, which she does not especially like but she wears it occasionally. She finished 28 radiation treatments in mid-December and what we hope will be the final chemotherapy series at the end of that month. 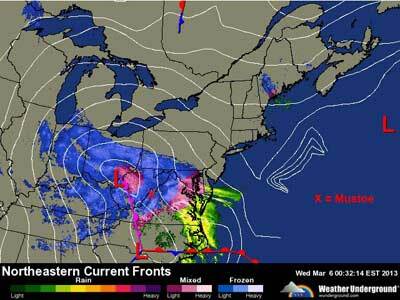 Sometime in January 2014 we expect to find out how well all of this is working. Stephanie flew in from Minnesota in October to visit and help out, Kathy came up from Roanoke several times, and a number of our local friends and neighbors have pitched in to help, especially with the driving. 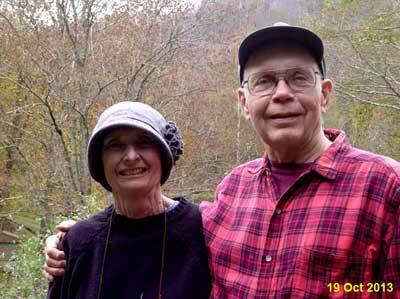 Radiation treatments are brief but they are five days per week and the hospital is 60 miles away over four mountains. Chemo treatments take several hours but they go for three days and then three weeks off between sessions. I was very pleased to have a couple of days off from driving each week. discharged from the rehab center in Staunton. I bought a movie camera last year and have been HD videos. My computer was woefully incapable of processing the large files produced, about 100 MB per minute, so in January I bought a new computer.